Janet Ayyad Ismail has never had trouble imagining that her future would be bright. She has always had a direction and purpose. Still, her ambition has never been blind. Janet’s path to her present reflects a willingness to consider many options and the courage to change course, if need be. Once in college, Janet decided not to declare a major until the end of her sophomore year and opted to study psychology and math rather than stick to her original plan to become an engineer. At the end of her junior year, Janet changed course again, choosing to pursue a law degree rather than attend graduate school. She wasn’t fickle; she was judicious. And, since joining the Dallas office of Haynes and Boone, LLP, Janet has been on a steady upward trajectory. Janet is a proud member of the Labor and Employment Practice Group, which was named the 2013 Labor and Employment Litigation Practice Group of the Year by Texas Lawyer. 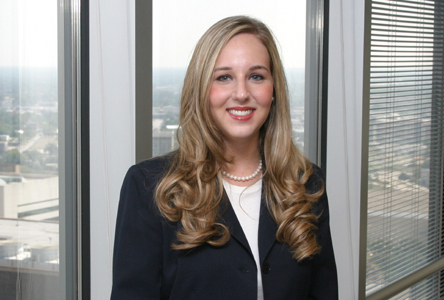 In 2013 and 2014, she was recognized by Texas Super Lawyer as a Rising Star in Employment & Labor law. Janet believes that the winding path she followed prepared her for success in labor and employment law. “I love psychology and math, and both have helped me hone my analytical and problem-solving skills,” both of which have been critical when litigating complex labor and employment matters and advising clients regarding labor and employment issues. The meetings she has attended as a Centurion helped strengthen Janet’s already firm belief in her responsibility to give of herself. Janet participates in many Dallas-area charitable events, including the American Heart Association’s Go Red for Women Luncheon and the Dallas Heart Walk. She also co-chairs the Dallas Association of Young Lawyers’ Attorneys Serving Troops Committee, which focuses on service, both legal and non-legal, to local veterans. Such service is just part of Janet’s DNA. “My parents were very involved in our education and the community. They instilled in us the importance of education and giving back.” Her mother, especially, was a great mentor throughout her academic journey. “My mom was there every step of the way—she was my rock,” Janet states.